It was nice to spend Martin Luther King day at the movies with my family. 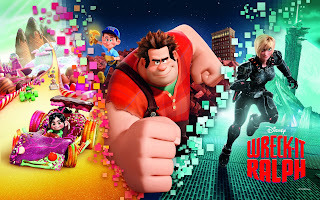 Our unanimous choice was Wreck-It-Ralph. My daughter was pretty excited to see it of course. It was more for her enjoyment than ours, yet I was the one who came home with tons of takeaways from the movie. I even cried for crying out loud! But the movie had lots of lessons to impart, if one's heart and eyes are open to see them. 1. Identity crisis happens to everyone. 2. It's Ok to feel jealous. 3. When you want something so bad, pursue it but be prepared for consequences. 4. We all make mistakes. No one is perfect. 5. We should learn from our mistakes. It's just stoopid not to. 6. True friends can be found in unexpected places and circumstances. 7. Believe in yourself when no one else does. Be yourself's BFF. 8. Better to have one true friend than to be like by millions who only like you for what you have and not who you are. 9. Always trust your heart. It's the key to happiness. 10. You are who you are. Accept who you are and embrace it. This is what makes you unique. You and I know that each of us are uniquely different in our own special ways. Like the characters at Wreck-it-Ralph, each of them are programmed a certain way exclusively. So are we. But if you ever decide to go Turbo and go wacko, I hope we can find Felix in time and fix you!